Dr. Casaletto is a Washington, D.C. native who escaped the big city to study biochemistry and theology at the University of Notre Dame prior to completing medical education at Vanderbilt and emergency medicine training at Carolinas Medical Center. Following residency, she practiced emergency medicine as an assistant residency director at Maricopa and residency director at Virginia Tech-Carilion. While in Arizona, she served AzCEP as councillor, secretary, and president in addition to serving Arizona patients as chairwoman of the Arizona Governor’s Domestic Violence Council’s Health Cares About Family Violence Subcommittee and via an appointment to Arizona’s Committee on the Impact of Domestic Violence and the Courts. Nationally, her service includes past-chair of ACEP’s Academic Affairs Committee and ACEP’s Young Physicians Section. 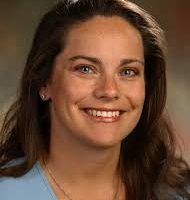 She currently represents her colleagues and patients in North Carolina as an NCCEP councillor and board of directors member and continues to serve nationally on ACEP’s State Legislative and Regulatory Committee and as a mentor for faculty members participating in ACEP’s Teaching Fellowship. Away from the hospital, you’ll find her wakeboarding with her husband, singing and dancing through Charlotte’s Thunder Road Marathon, or being chased by her toddler and elementary school age Padawans bearing their light sabers!